Today, fortunately, the rain stopped for a moment and I was able to take some quick shots of me layering up in leather and neutral tones. I love this blazer, camel wool blend material with black leather collar and sleeves! Thought I would tone it down with a simple sweater underneath and then edge it up again with leather stirrups and lace up boots. 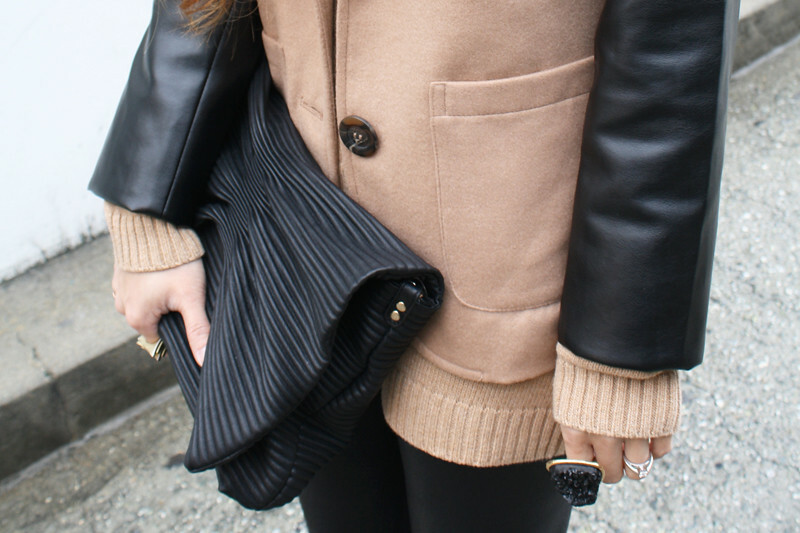 Two tone wool and leather blazer from F21. Thrifted vintage cowl neck sweater. Leather stirrup leggings from Hong Kong. Ribbed leather clutch from my work Sway. Cuffed lace up boots from F21.